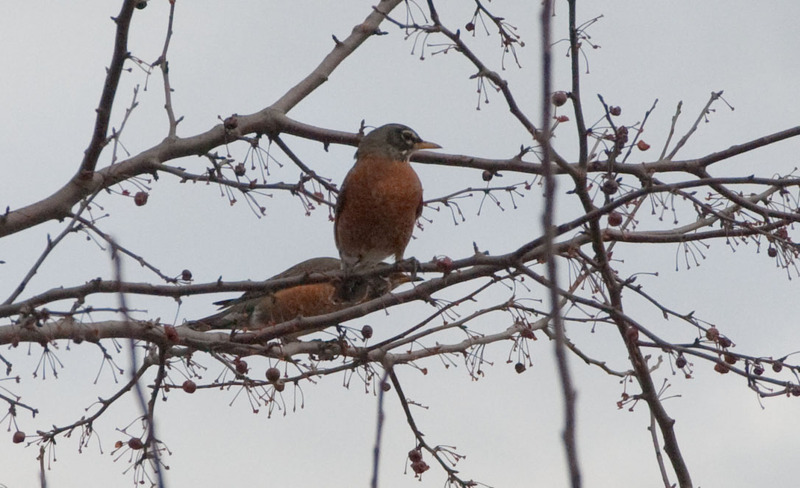 A flock of robins arrived in my Albany, NY neighborhood today. I used to consider them a harbinger of spring, but these days I’ll see one or two around occasionally during the winter. (Apparently some of them stay in upstate New York over the winter.) Still, seeing a flock of robins in the middle of February seems unusual. Strangely enough, they were not my first “harbinger” of spring. 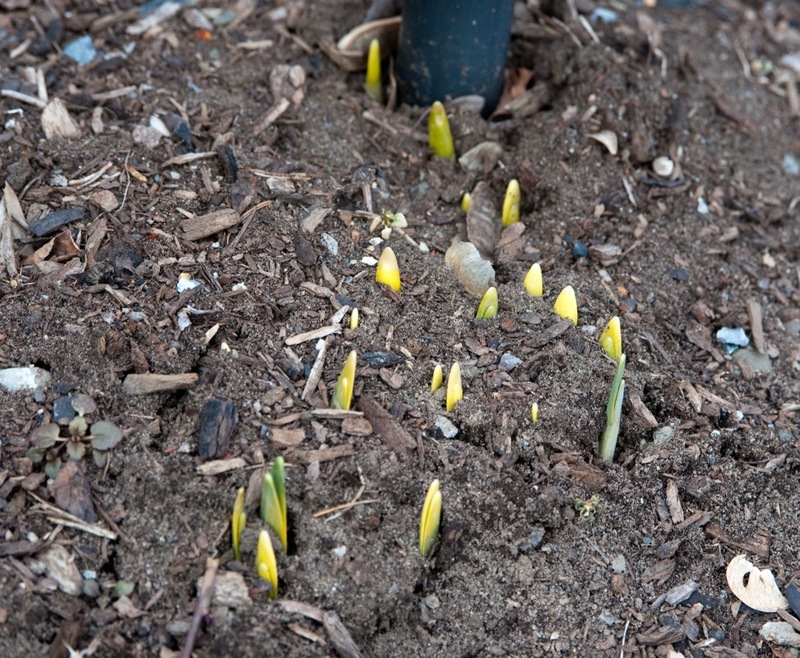 That honor would go to some daffodils I have, whose tips first made an appearance around the third weekend in January. I don’t see what “valuing freedom” has to do with recognizing scientific facts – unless it has something to do with maybe a freedom from reality. And apparently conservative weather observers tend to be selective in their portents about climate change. They don’t seem interested in things that disagree with their perspective – like the absence of snow at the Vancouver Winter Olympics or the early appearance of robins and daffodil shoots in upstate New York. It sounds to me like they’re engaging in a bit of cargo cult science. I had a conversation (of sorts) with a friend who happens to have strong Republican/conservative views. He gave the usual anti-warming arguments – it’s a natural phenomenon, some climate scientists did funky things with their email, etc. – and concluded with the point that while he thinks global warming is happening, he doesn’t see any way humanity could be responsible for it. He then walked off before I could talk to him more on the subject. I always find the claim that there’s no way human behavior could affect the weather rather curious. I remember a similar claim being made back in the 1980’s about acid rain. Interestingly, we gained an added perspective on human responsibility for acid rain when the Clean Air Act actually led to a reduction of acid rain. I’ll leave it to the experts to discuss the hows and whys on the relationship between global warming and local extreme weather events like a snow storm or two on the east coast of the US. I tend to consider this issue by asking a question drawn from chaos science. Edward Lorenz began the study of what became chaos theory when he discovered what came to be called the butterfly effect. The term came from the title of a talk he gave on the subject: “Does the flap of a butterfly’s wings in Brazil set off a tornado in Texas?” The point of the talk was that tiny variations in the makeup of a dynamic system – such as the weather – can have a profound effect on the outcomes of that system. My question regarding global warming is: if it’s possible for something extremely subtle – like the flap of a butterfly’s wings – to have an effect on our climate and weather systems, how could it be possible for trillions of tons of carbon dioxide released through human activity to not have a profound effect on those same systems? This entry was posted in chaos and tagged Butterfly Effect, global warming, weather. Bookmark the permalink.